Note: We cut the pizza like we normally do unless you request bigger slices. Restrictions may apply. *Choose From: Greek Salad, Chef Salad, Spinach Salad or Ceasar Salad. Chicken Ceasar Salad or Chicken Roasted Salad add $2. Mention and present coupon. Not valid with any other offer or coupon. Expires without notice. $15 minimum for delivery. Delivery charge may apply. Plus tax. Restrictions may apply. Mention and present coupon. Dine-in Only. Not valid with any other offer or coupon. Expires without notice. Plus tax. Dine-in only. Restrictions may apply. 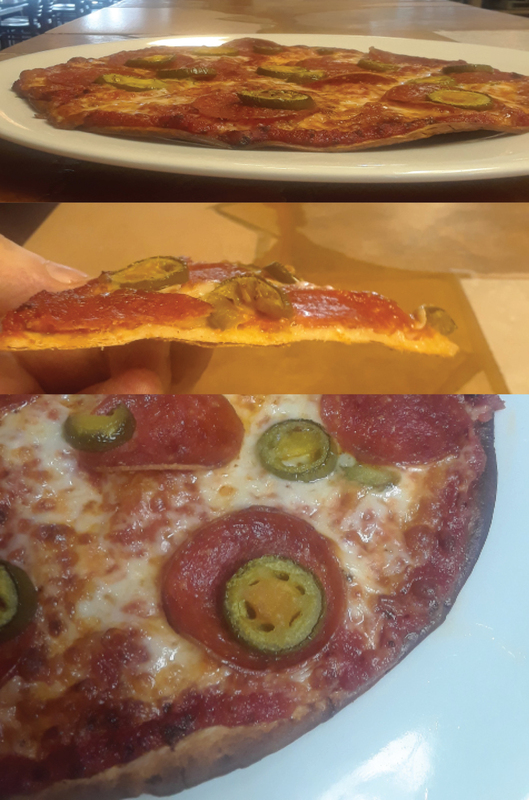 on low carb diet crust. Gluten free available at addtional cost. Note: pizza is very thin, my have some burn on crust. Mention and present coupon. Dine-in Only. Not valid with any other offer or coupon. Expires without notice. $15 minimum for delivery. Delivery charge may apply. Plus tax. Restrictions may apply. Mention and present coupon. Dine-in Only. Not valid with any other offer or coupon. Expires without notice. $15 minimum for delivery. Delivery charge may apply. Plus tax. Whole wheat crust is available at additional cost. Restrictions may apply.